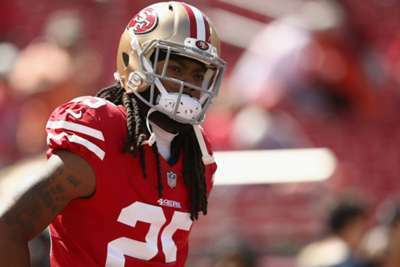 NFL offenses have been on a record-setting pace through the first four weeks of the season, and San Francisco 49ers cornerback Richard Sherman thinks that is exactly what the league wants. Sherman said the league has changed multiple rules over the past few seasons, making it harder for defenders to stop opposing offenses. “The average quarterback's passer rating is like 92 and that used to be Hall of Fame numbers,” Sherman told reporters. "And now it's not Hall of Fame numbers, that's the average quarterback. "They're just trying to make it impossible for guys to play defense. It's an interesting league we play in. "You can't hit a receiver too high, you can't hit him low, you can't push him. You can barely press him. It's making it really difficult on teams to combat it because every rule in the book is designed to make sure you don't get them stopped." The 30-year-old is in his first season with the 49ers. He was a four-time Pro Bowl player with the Seattle Seahawks from 2011-17.